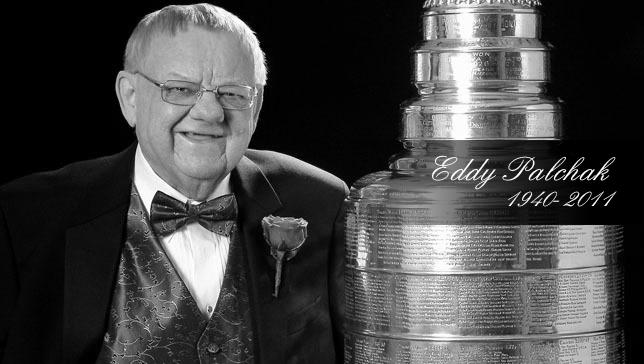 MONTREAL - The Montreal Canadiens organization was deeply saddened to learn that former Head Equipment Manager Eddy Palchak passed away after a long illness. Palchak, 71, died Wednesday night at 8:30 p.m. at the Montreal General Hospital. He had been a member of the Canadiens’ organization for 31 years. Born in Montreal on May 20, 1940, Eddy Palchak grew up in Ahuntsic where he won scoring titles at the bantam and midget levels. In his final year of competitive hockey he led the Montreal Juvenile Hockey League with 35 goals and 30 helpers. At 19, he coached the NDG Junior B team under the supervision of the Canadiens Phil Wimmer, while attending Loyola College. In the mid-1960s, he attended the Memorial Cup tournament in Toronto, where the Junior Canadiens were battling the Marlboros and when the team’s trainer came up with a sudden illness, he filled in and his career was under way. In 1966-67, after a year of learning the trade with the Junior Canadiens, his hard work and dedication earned him to join the Canadiens as assistant to veteran trainer Larry Aubut. Throughout his 31-year career with the Canadiens, Palchak etched his name on the Stanley Cup 10 times, an NHL record for a member of the support staff in NHL history. In 1998, he was inducted into the Hockey Hall of Fame in the Professional Hockey Athletic Trainers Society (P.H.A.T.S.) for his contribution to the game.